If this is what we have to look forward to now that the summer movie season is officially off to a start, I think we may be in for a bumpy ride. X-Men Origins: Wolverine is every bit as bad as the trailers suggest, offering nothing new to the genre and failing to capture that same magic that made the first two X-Men movies so good. 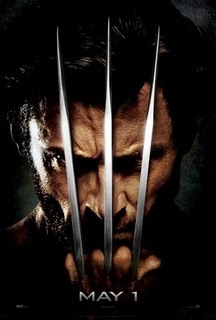 As the title implies, this newest action hero offering traces the origins of Wolverine (Hugh Jackman), his relationship with his half-brother, Sabretooth (Liev Schreiber), and how he acquired his famed adamantium claws. The problem is that, like many origin stories, the reasoning behind the character's motivations is irrelevant. Sometimes not knowing is more effective, but if a story like this must be done, I expect something more than this trite, uninteresting superhero fodder. X-Men Origins: Wolverine has many problems, but one in particular stands above the rest. The reason other superhero movies can be so riveting and suspenseful is because the characters are physically flawed human beings, susceptible to damage. During battle, the imminent threat of death is constant, which adds a layer of tension to the proceedings. But as this film points out, Wolverine is "indestructible," thanks to his skeletal system being reinforced by adamantium, a metal impervious to damage. One scene follows Wolverine as he flees from a helicopter that is unloading clip after clip of bullets in his direction. The dilemma is that he can't be hurt. If he gets hit by a bullet, what will it do? Nothing. He might get knocked back a tad, but he will simply get back up and keep going. This scene is supposed to be exciting, but without the threat of death, it's instead pointless and boring. But I don't want it to sound like I don't enjoy the character. Wolverine is a multi-layered character, one of the most famous in comic book history, and Hugh Jackman plays him well, even if he overdoes it at times, gritting his teeth and trying to look tough even when doing the most trivial of things. However, the other X-Men movies had many characters, almost all of which were physically fallible, so although Wolverine couldn't get hurt, his comrades could. By focusing solely on Wolverine this time around, the movie runs into a quagmire, unable to keep the viewers on the edge of their seats because of the knowingness that he can't actually be killed looming over their heads. All the same, the movie just isn't written well, including some truly rotten one-liners and dialogue exchanges like one between Sabretooth and Bolt where Bolt says, "I'm not afraid of dying," and Sabretooth replies, "How do you know? You've never tried it before." Please. Being the first summer blockbuster of the season should be something to be held with aplomb, but X-Men Origins: Wolverine mucks it up. The action is underwhelming, the special effects are piss poor, and the overall finished product feels like it was rushed solely for the purpose of being first. I can't say I'm surprised by the total lack of effort put into the film, but it's still hard to not be disappointed given the potential of the franchise and the infamousness of the character. The summer's starting out bleak indeed.